I'm getting really excited for the holiday season! Eric and I went to Bath & Body Works last week and got a candle that smells just like a Christmas tree (Fresh Balsam) to burn next to our four foot fake Christmas tree. Maybe it will seem like a real tree?! lol. I definitely want to start buying "real" Christmas trees once we get settled somewhere (not sure we could fit one anywhere in our current apartment). So anyways, we bought this great candle and a holiday "sleeve" to go around it. 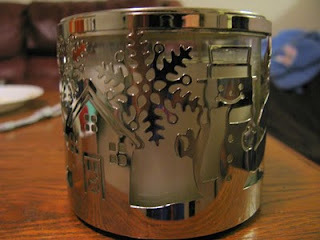 Here's a link to the sleeves on the Bath & Body Works website -- Candle Sleeves. We got the "Village" sleeve which has a snowman, Christmas tree, and snowflake on it. The only bad part is that they are easy to get fingerprints on...but that is going to happen with almost any silver like product. The best part is that they are only $5!!! A cheap, easy way to add some holiday cheer to your candle (and room!). Then--- It's November!! !---And that doesn't just mean my birthday has arrived-- It's Secret Reward Month at Victoria's Secret. All you have to do is buy a minimum of $10 worth of merchandise (up until Nov. 30th) and you will receive a Secret Reward card that can be redeemed Dec. 1-19, 2010 for $10, $50, $100, or $500 dollars off your purchase! You don't know how much it is worth until you redeem it, but every card is at least $10 off your purchase. So...why am I so excited about this?! Well...because I won the $500 off last year! Yes...it really does happen to people! (And I can hope with all my might that it will happen again!) ;) Being my cheap self, I was going to buy something that was a little over $10. After the cashier rang up my reward card she said I had a balance of 400 and something dollars. I was like, "Are you kidding?!". COMPLETE shock ensued. All I could say was thank you and slowing walk away while customers in line sent there congratualations my way. Once I got home I was bouncing off the walls, running around my living room screaming! I can't imagine I will get anything more than $10 off again, but a girl can dream right?! Thanks for the great gift idea..and money saver! I saw your question about how winners are picked on my blog so came on over. I use RANDOM.org and you just put in the number of entries and it gives a list of numbers in random and I go to the post and that's how winners are picked. As for how I give so many books away...mostly from publishers or authors or publicity companies. I will send you an email as soon as I get a chance and explain. Have a great day...and happy late birthday!